This is a planetary nebula situated in the constellation of Vulpecula. The distance to this object is 1360 light years. It can be seen with a binoculars. 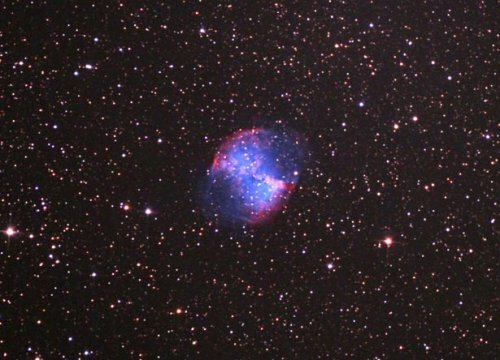 A planetary nebula consists of glowing shell of gas and plasma formed by certain stars at the end of their lives. This image was taken by CK Lim with an 8 inch Newtonian Telescope on June 13, 2007. Consists of 17 images, each with 60 seconds exposure on Canon 300D camera set at 1600ASA. Taken from Balik Pulau, Penang.